Social media can be a hugely powerful tool for reaching a wide audience, if used correctly. When used correctly, social media will allow you to reach millions of people, and not cost you a penny. One of the most popular questions that we are asked is ‘how do I go viral’. We are going to look at viral marketing and how it can work for your business. We are going to use our digital marketing work with Cabinteely Football Club as a case study for our discussion on viral marketing. Viral marketing is all about creating the type of content that social media users will feel compelled to share with their friends and followers. It is no easy task but the rewards for your brand can be huge if you can pull it off. If users are sharing your content for you, then there is no need to invest in boosting the post on Facebook, or as we will look at, your content can be shared by media outlets which will give you free media exposure worth thousands of euro. This type of online marketing is not for every brand though, it needs to fit in with your brand image. Generally speaking, the organic reach of your Facebook posts can be as little as 2-3% of the total following on your page with advertising spend often needing to be spent to reach a wider audience. One of the main benefits of viral content is that you will reach a wider audience than ever before, all for free. With every like, comment or share by social media users, your organic reach will continue to climb which starts a domino effect. If the content is good enough, the more people that see it, the more engagement there is and this cycle continues as your content ‘does the rounds’ on social media. In our work with Cabinteely F.C., we have run a number of viral marketing campaigns designed to create brand awareness about the League of Ireland’s newest club and to bring attention to upcoming home matches. This led to us winning the FAI Grassroots & Communications Award for Best Use of Social Media, you can read our blog post about our first digital marketing award here. We have also been nominated for countless awards for our viral marketing with Cabinteely F.C., we were nominated in the category of Best Social Media by the Federation of Irish Sport, our entry was up against governing bodies of sport, the IRFU, GAA, Cricket Ireland. Cabinteely FC was the only entry that was not a governing body, the outright winner on the night was the IRFU for their campaign for the Rugby World Cup. As a result of our digital marketing work with Cabinteely FC, we were asked by the Football Association of Ireland (FAI) to give a talk in their headquarters to all of the League of Ireland and Women’s National League clubs on social media and how to use it effectively. You can read about our social media talk here. We will run through a number of our different campaigns that we have run and the different ways in which the idea came about. Unfortunately, there is no set formula for coming up with viral content. Viral content by it’s very nature needs to be different in order to stand out from the crowd. Read on for a few of our different social media stunts, and how the ideas came about. As part of our work with our clients, we are constantly monitoring social media to see what is being said about them, this is a great form of customer feedback. After Cabinteely scored a 96th minute equaliser against the league leaders (you can watch the goal below), a lot of punters were tweeting about how Cabinteely caused them to lose their bets. As a result of this, we thought about how we can turn this negativity into a positive for the club. We decided that for the next home game, anyone who presented a losing bet slip would get free entry to the game. This was picked up by media both in Ireland and the UK featuring in both digital and print editions of some of the biggest newspapers. This helped us to achieve our goal of brand awareness and also create hype for our next home match. You can read all about our offer on Cabo’s website. This led to bookmakers such as Paddy Power offering odds on the Ivory Coast international signing for Cabinteely F.C. When we were putting together some stats for a blog post that we were writing for our clients, we thought it might be funny to compare Cabo’s players to a famous footballer, after looking through a number of different footballer’s stats we decided that Mario Balotelli was the perfect fit for what we wanted to achieve. We displayed the stats in a Sky Sports style graphic, we wanted it to be a case that only the photo needed to be shared so we needed the photo to be able to speak for itself. 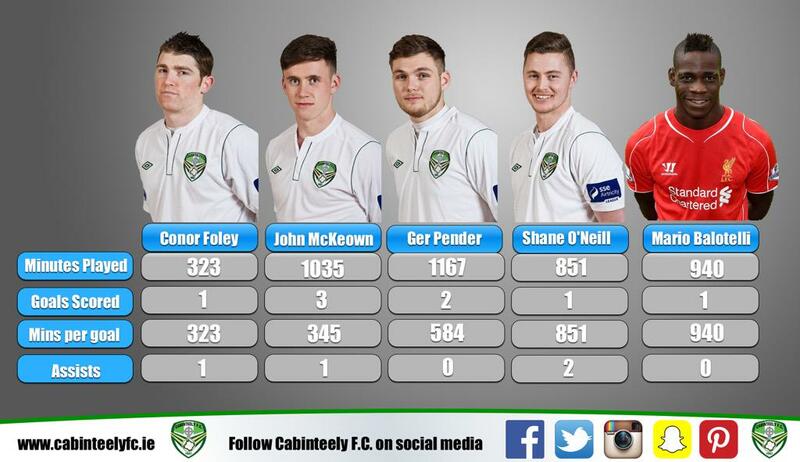 We also added in a bar at the bottom with all of Cabinteely’s social media profiles. We anticipated that this post would perform quite well on social media so we wanted to make the most of this exposure. In the tweet that we sent to Balotelli, we were also sure to include details of our upcoming match. You can check out the tweet below. This tweet was seen around the world. International media shared the story, it would be impossible to put a price on the media coverage that the club received as a result of this tweet. Our biggest promotion was still to come however. As Cabinteely F.C. were the newest member of the SSE Airtricity League, they had never featured in the popular computer game Football Manager before. To celebrate the club’s entry to the game we ran a very special competition which we announced on social media. The first person to win the Premier Division with Cabinteely F.C. would receive a free 2016 season ticket. We even worked with Sports Interactive, who produce the game, to add a special prize of the winner being added into the game as a player. This got huge coverage internationally. It also led to Cabinteely being the most played with Irish team in Football Manager on the opening weekend of the game. Check out the video below from Fox Sports talking about our competition. The Football Manager competition was an idea that we had first thought of in May but we needed to hold off until November for the launch of the game for this idea to have maximum impact. Through each of these viral social media campaigns, we achieved our goals of creating brand awareness. We are now in a position whereby fans are suggesting what the next campaign will be. This is brilliant as it means the club are getting publicity without having to do any work. For example when Conor McGregor announced his ‘retirement’ a lot of people were tweeting how he would sign for Cabinteely F.C. Our social media campaigns featured on over 60 different media outlets around the world. On the back of our digital marketing work, there were visitors to the Cabinteely F.C. website from over 114 different countries. Our social media content reached millions of users. Digital marketing is an investment, and by investing in hiring The Link Marketing as their digital marketing agency, Cabinteely FC have made their investment back tenfold. Check out some of the different media outlets that have featured our digital marketing work. For a complete round up of every news story about our social media campaigns, check out the Cabinteely FC website which tracks each story and shares a link to each news item. All of this media coverage was generated free of charge, this goes to highlight the power of digital marketing and viral content. To advertise with each of these platforms would cost tens of thousands, but with the right digital marketing agency, you can achieve this coverage for free. The Link Marketing are an award winning digital marketing agency based in Dublin. We are a full service agency offering the complete package of digital marketing services from social media management to search engine optimisation to online advertising and more. If you would like to discuss how we can grow your business, we would love to hear from you. Drop us an email at info@thelinkmarketing.ie or give us a call on 0879344402, we would love to discuss your business goals with you and how we can help you achieve them.